The SCC3 kit is the heart of a 12 Volt solar power system, it regulates the charging of batteries from photovoltaic (PV) solar panels. A charge controller is an essential part of any solar power system. A 12 Volt solar power system can provide power to a wide variety of devices such as lighting systems, Ham and CB radios, car stereos, cell phone chargers, laptop computers, televisions, recording equipment, fans, water pumps and other 12V DC loads. With the addition of a DC to AC inverter, the DC power can be converted to 120 Volts AC for running many household electronic devices. The SCC3 is suitable for stationary and portable solar power systems. It is an excellent choice for emergency backup and stand-alone building power systems. The SCC3 is also perfect for recreational vehicle solar power systems. Combine the SCC3 with a solar panel and rechargeable battery for a reliable source of DC power that's available, even when the power company is not. Controls and indicators include a battery float voltage adjustment, a battery equalize (overcharge) switch and a red/green Charge/Float LED. See the SCC3 specifications for details on the kit's capabilities. The SCC3 Photo Gallery shows some real-world uses of the SCC3. 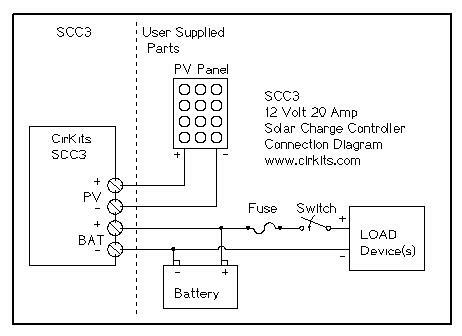 The SCC3 kit makes a great student project, it can be used as the foundation for many solar powered projects. The efficient design is suitable for charging large banks of lead acid batteries or small packs of rechargeable cells. A high quality double sided, silk screened circuit board. All of the parts required for building the board. A schematic and wiring diagram. Easy step-by-step assembly, alignment and usage instructions. Batteries, solar panels, and solder are not included with this kit. Discounts are available for orders of 10 or more kits. U.S. addresses, First Class Mail shipping and handling: $5.00 per kit, add $1.00 each for additional kits. U.S. addresses, Priority Mail shipping and handling: $10.00 per kit, add $2.00 each for additional kits. Overseas, Canada and South/Central America addresses, Shipping and Handling: $14.00 for 1 kit, add $3.00 each for additional kits. Send email for a quote on multiple kit types, please use the address at the bottom of this page. Credit cards (click the PayPal buttons below). Mail a U.S. postal money order. Mail a check made out to CirKits.com (U.S. customers only). Wire transfers only accepted for orders over $500, $35 fee applies. Customers who live in Colorado should add $2.16 tax per kit to the total price of the merchandise. If you would like to mail your payment, total the price of the kit or kits with the desired form of shipping and tax if you live in Colorado. Include the address to ship to and an email address if you would like shipping confirmation. Your order will be processed and mailed when the payment has been received. Alternative Energy Web Sites for sources of solar panels and batteries. 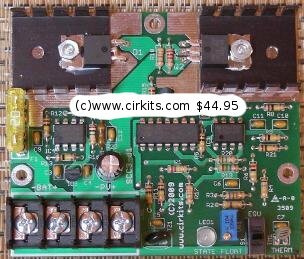 CirKits Home Page for more electronic kits. This is a de-spammed email address, you need to type it in.